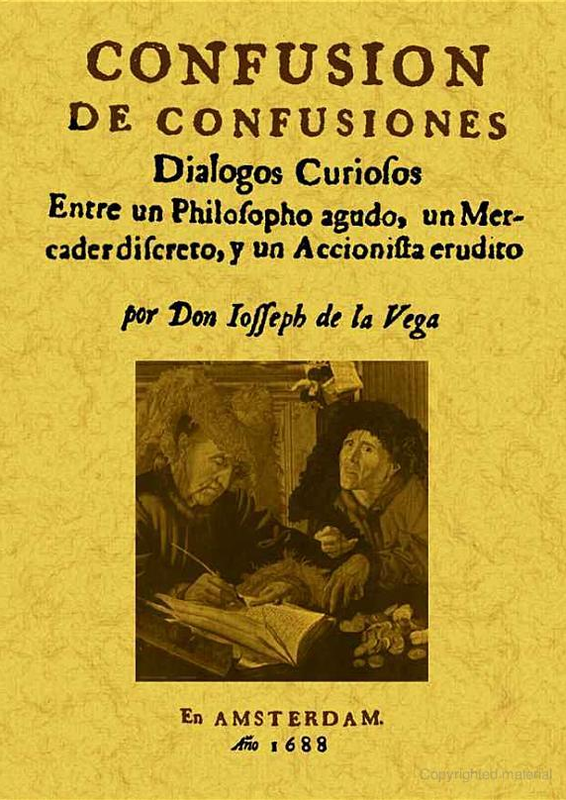 Confusions de Confusiones - IFA Vintage and Current Book Library - Index Fund Advisors, Inc.
eBook: Google eBook, The Confusion of Confusions: Between Speculation and Eschatology, Paul Held, Univ. of CA, Santa Cruz. Notes: Originally published in 1688. Description at QFinance. This is the oldest book ever written about the stock exchange business, and it made de la Vega famous for his insights and stories about speculation in the 17th century. Considered a classic, as the type of trading intricacies and market manipulations of the time are still with us today. Presents four rules of speculation that are still relevant: never advise anyone to buy or sell shares; accept both profits and losses; profits do not last; you need both money and patience.